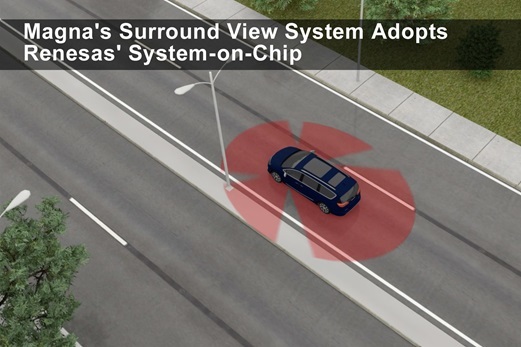 Renesas Electronics Corporation, an industry-leading supplier of automotive semiconductor solutions, and Magna, a mobility technology company and one of the world’s largest automotive suppliers, aim to accelerate the mass adoption of advanced driving assistance system (ADAS) features with a new cost-efficient 3D surround view system designed for entry- and mid-range vehicles. The 3D surround view system adopts Renesas’ high-performance, low-power system-on-chip (SoC) optimized for smart camera and surround view systems. By enabling 3D surround view safety capabilities, the new system helps automakers to deliver safer and more advanced vehicles to a larger number of car consumers, contributing to a safer vehicle society.